I’ve been getting lots of requests for workwear style posts lately and, though I wouldn’t claim to be an expert in this area (I’ve been out of the corporate world for over 10 years), I thought I’d share an office-appropriate look with you today. The last office job I had was a business casual environment, so I gravitated towards sophisticated separates that I could mix and match week after week. Even when you’re dressing for work, there are simple ways to inject your personal style into your looks – these tiered bell sleeves offer a trendy take on classic lace (and the slightly shorter sleeve length means they won’t get in the way while you’re typing) & these statement earrings lend a cool modern feel (much more exciting than your everyday hoops!). Such a classy, feminine and glam outfit! Your earrings are wonderful and I think that your laced top is fantastic, must have piece too! That’s such a classy look. Love it. Thanks for the post! 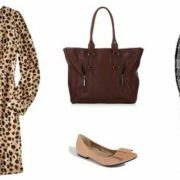 In the past three months, I’ve actually found a lot of office wear at Talbots (a little surprising because I always felt they were for the 60+ crowd. I’m 33). They are gravitating toward more trendy, but appropriate, work attire including ruffles, scallops, embroidery, cropped work pants, wide leg pants, and twists on basics. I think their initial price point is high; however, they have great sales. I bought two pairs of work pants, a pair of jeans, and an embroidered dress tank top for only $90 this past weekend. I liked a lot from their fall line so I’ll be waiting for that to go on sale shortly. Yes I think Talbots has done a bit of rebranding recently & I’ve also noticed lots of great options from them! What a fantastic classic look in a trendy stylish new way! The red clutch and red lips are a perfect splash of colour!